On December 6, 2018, in “Yyldyz” Hotel of Ashgabat an international ministerial conference on the theme “Importance of the Great Silk Road: Present and Future Development” organized by the Government of Turkmenistan in cooperation with UNESCO concluded the plenary sessions. 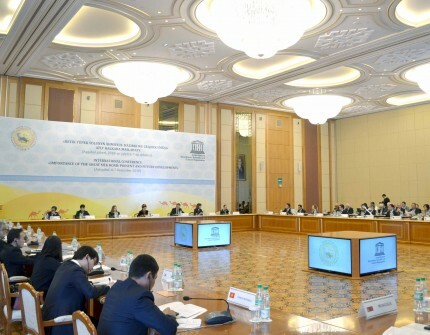 The purpose of the international conference, which is held with the participation of representatives from about 40 countries, is to reveal the role and the importance of the Great Silk Road for sustainable development, discuss the possibilities of the common heritage of the Silk Road for the development of international cultural cooperation in modern society, and exchange experience and knowledge of the Silk Road heritage to achieve the UN Agenda 2030. The Head of the Organization for Culture and Islamic Relations of Iran Mr. Abuzar Ibrahimi Turkaman, Deputy Minister of Information and Culture of the Islamic Republic of Afghanistan Ms. Sayeda Mojgan Mostafavi, the Deputy Minister of Culture and Tourism of the Republic of Turkey Mr. Ahmet Haluk Dursun and Ambassador Extraordinary and Plenipotentiary of the People’s Republic of China in Turkmenistan Sun Weidong spoke at the plenary meeting of the international conference. After the completion of the work of the international conference “Importance of the Great Silk Road: Present and Future Development”, the participants will attend the cultural events which were planned for them.